War of the Realms #2 Review – AiPT! Aaron and Dauterman’s epic event rolls on. 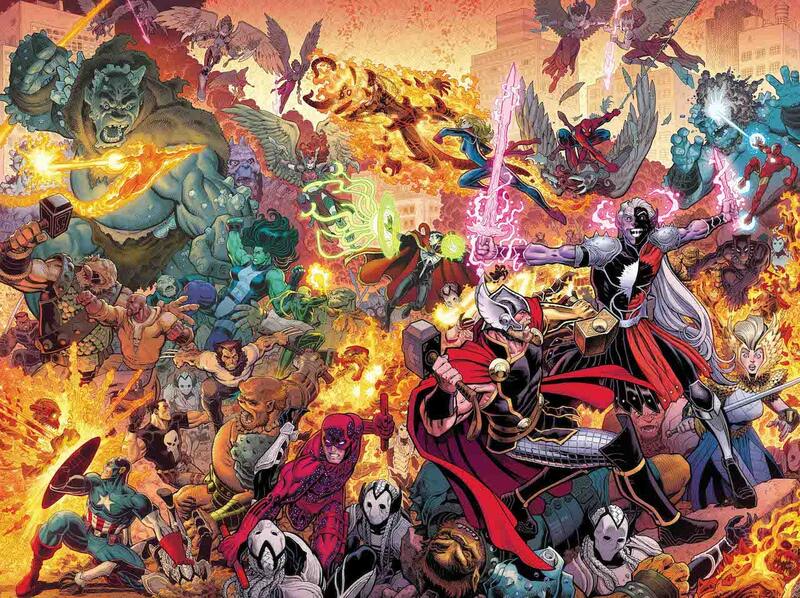 War of the Realms is Jason Aaron and Russell Dauterman’s epic finale to an incredible run on Thor. This summer event came out swinging in its first issue, integrating many heroes and blowing readers away with triple-A art. The second issue is already here and the war has ravaged Manhattan in mere minutes. In a six part event, we’re at the part where the heroes are totally screwed. This series is huge in scope, affecting the entire line of Marvel Comics and coming with it the special tie-in three-part series. You best read it or be lost until the end of June when the series finishes. The minute Logan comes back to life he’s gotta commence with the killing. I’m okay with that. This issue supplies plenty of new villainous subordinates, interesting twists, and proper event developments to keep your interest and make you want to invest in the tie-in series. That goes for Punisher, Doctor Strange, and the various villains who are introduced and need smiting. On that level, this event works very well. There aren’t quite as many great superhero quips as the first issue, but most of the heroes that seem to be in focus for the event get a moment save for Spidey. This issue is more about establishing the stakes and where the heroes go from here. If the first issue was opening salvo of the war, this issue is the finish to that and the ultimate regroup that is required to salvage and save Earth itself. To that end, this issue works well, too. Possibly the biggest surprise of this issue is how Jane Foster is such a huge part of it. I’ll say no more to avoid spoilers, but it appears her role in Aaron’s longstanding run isn’t over by any means. Key Asgardian characters also make a splash, further putting this into the realm of Thor and his ilk well. I can’t say enough about Russell Dauterman and Matthew Wilson’s work here. The use of perspective to draw your eye into the action is unparalleled and I’m often thinking about the cinematic experience when reading books by them. Joe Sabino does well with letters too, especially when Doctor Strange goes into spell casting. As always with Dauterman and Wilson, the use of blur is exceptional and makes an action scene come alive. Dauterman might just be the best artist when it comes to eyes, too. His ability to add life to these characters starts there. A hero makes a big mistake of sorts when trying to save others that’s a bit of a head-scratcher. At the very least, the weight of the hero dying at the end is lessened due to a blunder being part of the cause. As far as the heroes taking a beating, it’s also a bit unclear that they’re actually losing. Characters say they aren’t doing well and are outmatched, but they aren’t taking much of a beating. There never seems to be any panels with many baddies on the page to convey the overwhelming numbers and since the heroes don’t seem to be having that much trouble it’s hard to fathom they’re losing at all. A good second issue that does the job as far as events go. You’ll enjoy the action and gear up for tie-in adventures, because this issue sets everything up so well. A good second issue that does the job as far as events go. You’ll enjoy the action and gear up for tie-in adventures because this issue sets everything up so well. Some interesting twists, plus Jane Foster is back baby!